Have some awesome DVDs but don't want to carry all of them together during a family trip? Or you would like to convert your favorite DVD movies to your Mac, either for backup or for playback on your MacBook in case carelessness scratch? In cases like these, you can rip DVDs to MOV files on Mac with a free Mac DVD to MOV ripper. MOV is a file extension used by the QuickTime-wrapped files. The format was created by Apple Computer to work with multimedia files. The advantage of MOV files is the ability to contain abstract data references for the media data. That means that they can be easily edited - no need to rewrite all media data after editing. Why rip DVD to MOV on Mac? Apart from these terms, using a QuickTime player to watch and control QuickTime movies could bring great pleasure. What's more, the new generation of digital cameras not only takes still photos with amazing clarity, but also records high-quality video in QuickTime format (MOV). DVD movies could not be played directly on QuickTime player, which should be converted to MOV files first. 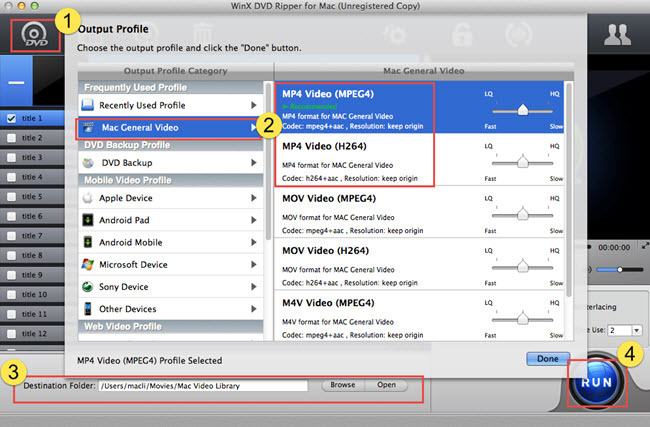 You simply need a free DVD Ripper on Mac for decoding and converting your DVDs to MOV video format. For Windows users to rip DVD to MOV, WinX DVD Ripper Platinum is the fastest DVD ripper software. Well, free Windows DVD ripper also could help you rip DVD to MOV, AVI, MP4, WMV, iPhone, iPad, iPod, etc. Fast Convert DVD Disc to Digital Video in MOV, MP4, H.264, HEVC, AVI, WMV, MPEG, ISO, etc. How to convert DVD to MOV with this free DVD ripper Mac? After download and run WinX DVD Ripper Mac Free, Click "Disc" button or add DVD folder by clicking "DVD" button to load your favorite DVD. After loading DVD, the DVD information will be shown in the file list and there will come out a profile windows automatically. Choose "MOV video" in the "Mac General Video" category. Click "Browse" button in output setting area, select a destination folder. Finish the above settings, check the files needed to convert in the file list, you could click "RUN" button to start ripping DVD to MOV. Part 2How to Convert DVD to MOV with this Free DVD ripper Mac?